WeatherTAP has partnered with EarthCast Technologies (ECT) to offer our subscribers access to global forecast data. ECT uses data from over 50 Earth-viewing satellites to initialize their global model. Each model product is forecasted in one-hour increments and covers a 36-hour period. The data sets are currently updated twice per day at 00Z and 12Z. You can read more about each of the products that are available by viewing the Global Weather Products information page. 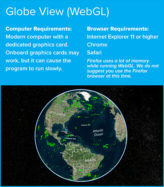 We offer two different ways of viewing the global weather data, a Globe View and a Flat Map View. 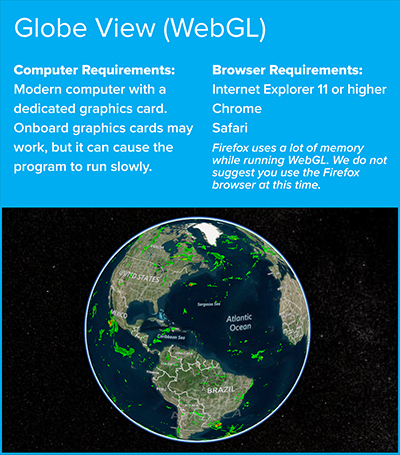 Some computers will not be capable of running the Globe View. Please read the system requirements listed below. To view the global weather data, just click on one of the images listed below.